You have the choice at your first visit. We can discuss the merits of the various treatment options and estimate the cost for you. However, not all of our services are covered by NHS treatments. When you visit us, we will go through which treatments can be included as NHS and which cannot. We offer 15 minute check-ups through the NHS. Some of our general dentistry treatments can be covered by the NHS just as long as they are not classed as cosmetic. We offer 3 price bands through NHS, covering treatments that consider your oral health and wellbeing. 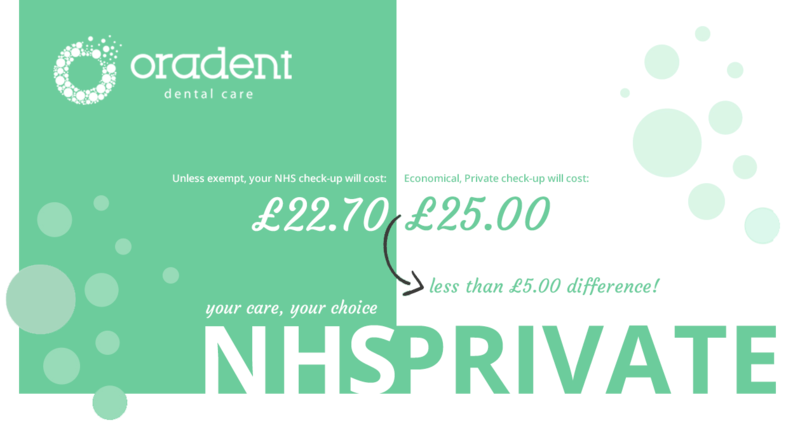 We offer an affordable alternative to NHS check-ups that include a more thorough service at a similar price. Private Dentistry has a broader selection of treatments that can fully transform your smile. We offer membership plans that combine our services in an unbeatable package, offering all you will need to maintain a beautiful smile.